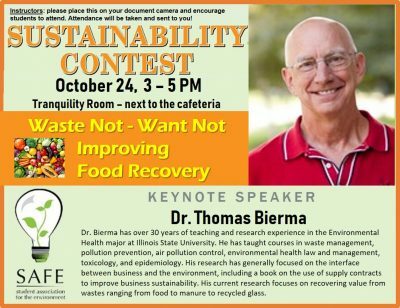 ICC will kick off its annual Student Sustainability Presentation Contest with keynote speaker Dr. Thomas Bierma, a professor and researcher of environmental health at Illinois State University, who will discuss “Waste Not Want Not – Improving Food Recovery.” His presentation and the annual student contest will be held Wed., Oct. 24 from 3 to 5 pm in the Tranquility Room on the East Peoria Campus. ICC students will present projects relating to a variety of sustainability topics immediately following the discussion. The presentation and Sustainability Presentation Contest are free and open to the public. Bierma has more than 30 years of teaching and research experience in the environmental health major at ISU. He has taught courses in waste management, pollution prevention, air pollution control, environmental health law and management, toxicology, and epidemiology. His research generally focuses on the interface between business and the environment. His current focus has been on recovering value from food wastes ranging from food to manure to recycled glass. The event is sponsored by the ICC Student Association for the Environment (SAFE) and the Sustainability and Greening the Curriculum Committee. For more information, contact Jennifer Scoby, at [email protected].